Just minutes from St. John’s is a stretch of water and coastline dotted with icebergs, humpback whales, and puffins. From May to October, the waters of Newfoundland and Labrador teem with the largest population of Humpback whales in the world as they migrate from the Caribbean, feeding on capelin and krill. The Humpback is a baleen whale, meaning they have a thick layer of bristles inside their mouth used to catch food. While Minke, Pilot, Sperm, and even Blue whales are found around Newfoundland, the Humpbacks put on the best show. Weighing 45 tons, they’re playful and unable to resist a good audience. The giant mammal will often emerge at the sound of an approaching boat, breaching with an impact like a meteor and slapping its tail on the surface. Other times it’ll flip its tail up like an obscene gesture, indicating it’s diving deeper, and may stay hidden for a while. You might also see mothers and calves swimming side by side or frolicking in the open sea. The biggest population of seabirds in North America — 35 million — has chosen Newfoundland as its home. Here, storm-petrels, razorbills, gannets, and even puffins coexist happily. To see them, head to Bay Bulls, a 25-minute drive from St. John’s on the Irish Loop. Boats launch from here to circle the Gull, Green, Great, and Pee Pee islands, which make up the Witless Bay Ecological Reserve. 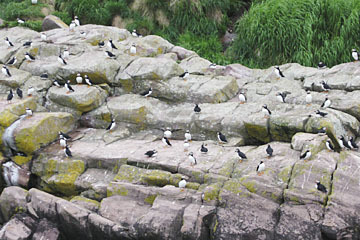 260,000 pairs of puffins nest on these islands during the late spring and summer. In fact, 95% of North America’s puffins live around the coast of Newfoundland. Other than puffins, there are thousands of black-legged kittiwakes and the common murre. Envisioning it is difficult — listening to the reserve is better. Approaching the islands by boat, your attention may be focused by the green hills, sharp cliffs, or even Humpback whales passing nearby. But at some point, you’ll look up to realize the sky is a black mass of movement as the birds hover around the islands like colonies of bats. Once the captain cuts the engine, the pure impact of the noise can be overwhelming. All along the islands, thousands of puffins roost on the rocky shores, and the hills are punctured by holes known as puffin burrows. The birds swoop and dive and skim the top of the water. Puffins are comical creatures; they’re better swimmers than fliers, with the ability to dive to 200 feet. They mate for life and their awkward, gawky bodies and colourful markings contrast sharply with the other marine birds in the reserve. Perhaps this is why the puffin has become Newfoundland’s official bird: they’re simply quirky. 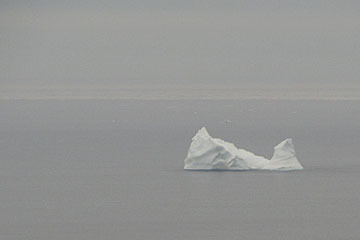 The arrival of puffins and Humpbacks also coincides with the appearance of icebergs. Iceberg Alley is the area stretching from the northernmost peninsula of Labrador down to the east coast of Newfoundland. Here, bergs from Greenland’s 10,000-year-old icecap make their journey and are usually seen during the end of spring, particularly May and June. Their size and shapes vary: tabular, blocky, dome, drydock, wedge, and pinnacle are all words used to describe these masses of ice. 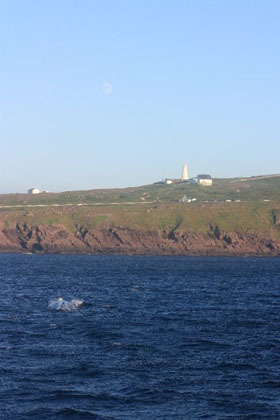 If you want to save some cash and skip the boat tour (see below), icebergs can often be spotted from St. John’s harbour or from the Signal Hill trail. Without leaving the trail, you can get fairly close to a berg when they float near the coast. Last year, inside the St. John’s Narrows, the biggest iceberg of the season appeared eerily to be suspended in mid air. The horizon disappeared as the misty sea and sky blended into each other, the iceberg floating between. Several boat tours operating during whale season are available from the St. John’s harbour, including Dee Jay Charters and Iceberg Quest. 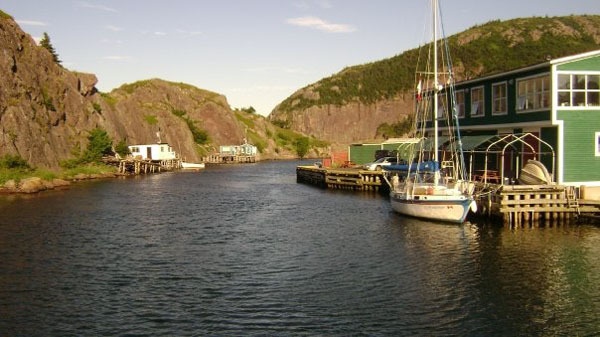 Both tours offer the chance to see whales and icebergs, but Dee Jay Charters is a less crowded vessel which also journeys around Quidi Vidi Village and Cape Spear, the easternmost point in North America. 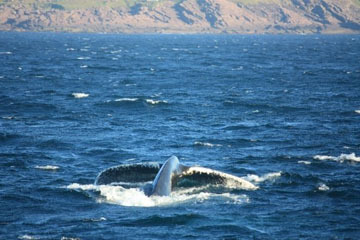 In Bay Bulls, boat tours such as Gatherall’s or O’Brien’s combine whale and bird watching. All tours come with good-humoured guides, fiddle music, and sometimes a dinner cruise. Dress warmly as even summers can be frigid in Newfoundland. Sea kayaking is another option for the adventurous: tour groups like Stan Cook Sea Kayak Adventures get you up close to the Newfoundland coastline and the Humpbacks, if you’re not intimidated by a house-sized mammal belly flopping just ten feet from your paddle. Matador member Ted Kern has a whale of a story about Swimming with Humpbacks, along with some nice pics. If you find yourself in St. John’s wondering what to do at night, read Candice’s article at Nights, One Night on George Street — a Newfoundler’s Guide to Getting Smashed in St. John’s.